These glazes will produce colorful, lustrous, and dramatic effects when reduced in a proper Raku firing. Be sure to use adequate safety measures when Raku firing- read more about this process below! 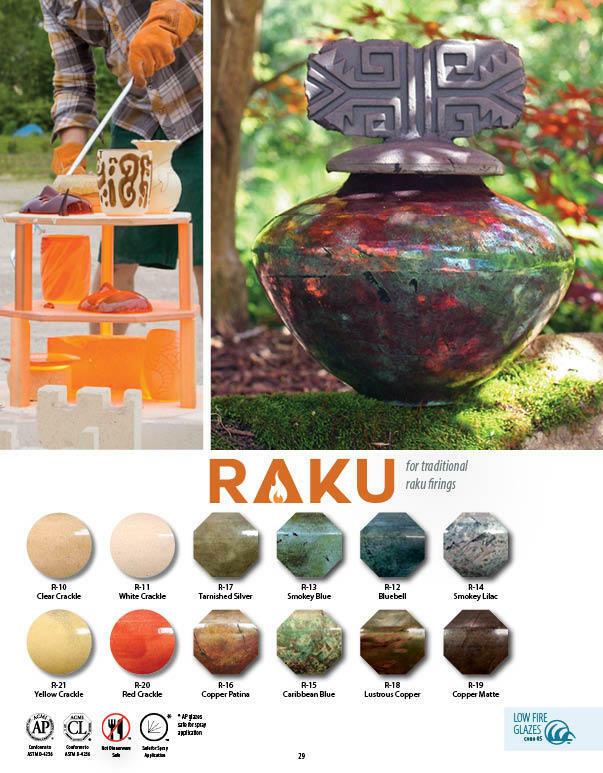 Here is a downloadable PDF of the Raku page from the 2015 glaze brochure. Our Raku glazes do not produce the very dramatic effects you see in our catalog until they have been reduced in a RAKU firing. Remember that these glazes need to be fired to their recommended temperature of Cone 05 (1911°F, 1044°C). Once they reach temperature, turn off the kiln; let it cool to about 1700°F, 944°C before you pull the pieces out of the kiln with the tongs. You must protect yourself from the heat when you open the kiln at that high of a temperature. Therefore, wear heat and fireproof protective clothing, use high temperature gloves, and an appropriate respirator to protect from smoke. If you are using an electric kiln, never pull material out of the kiln unless the kiln is turned off. RAKU is a very unpredictable medium and is affected by many variables. The effects achieved with these or any other RAKU glazes may not always be the same. Even after you have done RAKU for a long time you will see that it is almost impossible to have complete control over the result or a consistent glaze effect even if you are using the glaze from the same jar. However this is a spontaneous technique and all the varied effects are usually acceptable. Tong marks and other marks from reduction material is considered a characteristic of RAKU, not a defect. Warning: Firing RAKU is an action filled procedure. AT LEAST two people (preferably more) are needed to unload and reduce the Raku. You must be aware of this smoky and intensely hot environment at all times, be prepared for it and act accordingly. You must wear heat and fire protective clothing, fire proof gloves and a mask appropriate for smoke. A NIOSH approved mask like 3M’s 3600 or a comparable quality mask is recommended. Make sure you cannot smell any smoke when you have the mask on. Never open an electric kiln when the switches are in the on position. All switches must be off before you load or unload the kiln. Always use tongs to carry hot pots from the kiln or from the reduction bucket. The reduction bucket must always be outdoors. RAKU gas kilns are usually outdoors but even if you are using an electric kiln you still have to take the pieces outdoors to reduce them. Do not be concerned about the piece cooling in the process, because it will still be hot enough no matter how far you have to carry it outdoors. RAKU can be safe and exciting when the right precautions are taken. RAKU is not for children. This technique is for adults or college students only.